I had given my laptop to my in-laws before coming to US. Their laptop died an unromantic death the day before I was travelling. Now, my in-laws and me, we are great at buying vegetables, groceries, stationary and a whole lot of stuff. But purchasing from the world of electronic media is beyond our capacity. So I gave my almost brand-new laptop to them. The only thing was I didn’t have the time to take back up or upload the pictures. Fast forward 8 months. Now my in-laws are visiting us. Yesterday my FIL mentioned about the pictures and I could see there are tons and tons of my food pictures in his laptop. Can you imagine my happiness :-)? This masala bread is one from there. 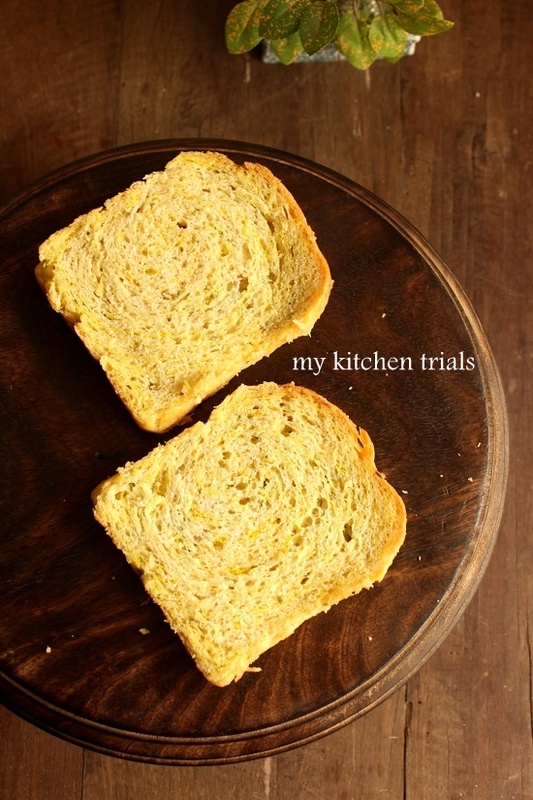 I have been almost grieving for this bread and its pictures :D.
This one is inspired from Nandini’s masala bread. I followed a recipe from the net. Mix all the dry ingredients in a bowl (flour, instant yeast, sugar, salt and turmeric powder) until combined. If you are using active dry yeast, you need to proof it in the milk until it bubbles up well. Add chopped items for masala and the oil/butter to the dry ingredients. Add the lukewarm milk in portions and knead until you get a smooth, soft dough. Shape into a ball and leave in a well oiled bowl. Cover the bowl with cling wrap or a lid. Depending on the temperature in the place, the dough will double in 1-2 hours. Doubling of the dough is the criteria and not the time. 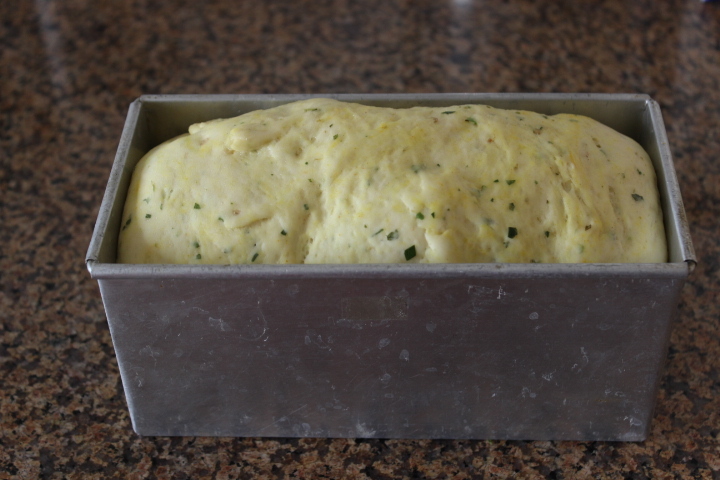 Once the dough has almost doubled, gently deflate it down and shape into a loaf and place it in a greased bread pan. Let it rise until it reaches 1 inch above the rim of the pan. About 1 hour or so. Bake in a preheated oven at 350F for about 40-45 minutes or until the top is golden and the bread sounds hollow when tapped under. Once its baked, I always rub the bread with a little stick of butter. Let the bread cool in the pan for about 10 minutes and then on the cooling rack until cooled completely. I too recently tried a savory bread with coriander and cumin!! This loaf looks absolutely stunning!! Warm bread with lil butter must have tasted out of the world!! 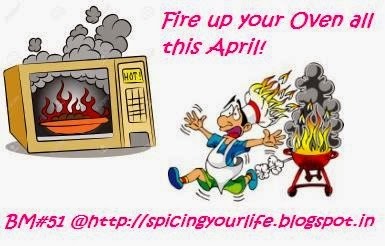 coriander and cumin is a great combo!!! the bread looks stunning!!! No Pradnya. They are here in US. I love masala breads…and so lucky that you got back your pictures..imagine how much we would have missed!…Is this loaf made with 3 & 1/2 cup flour Rajani?..I have a similar loaf tin so wondering if I can blindly go with the same measurement! Yes valli. This pan is quite deep. 3 1/4 would fit in fine. I haven’t tried baking this spicy loaf yet. This would be great breakfast loaf. Wow, lucky you — finding long lost pics is like finding a precious treasure :-) I was wondering about your cute little plant in the pics and no wonder they are from pics from India. Masala loaf sounds very tasty and looks soft & fluffy. Very interesting bread. Nice even crumb on the slices. Must have tasted great. Masala loaf is my weakness, thats an incredible loaf..I can have them anytime..
Wow ..isn’t it a sense of great happiness when you find some kind of lost pics..well I too got some recently…. The masala loaf looks just wonderful with a lovely texture. Lucky you!! The loaf looks too good. Sounds like a flavorful and delicious loaf..wish to have a slice..